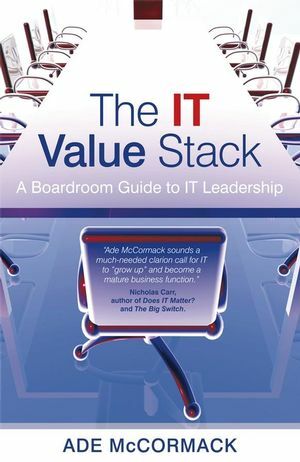 Value-driven IT focuses on how organisations can get the best value from their IT Investment. A program that involves the board and the business, the book also provides guidance and tools to carry out the exercise. Ade McCormack has over twenty years experience in the business-IT space. He is also a public speaker and coach. Ade has a column in the Financial Times advising business leaders on business-IT issues. He is also author of the acclaimed book – IT Demystified. An astrophysicist by training, he entered the IT industry as a real-time embedded software engineer. Through Brownian motion his career recoiled into project management. Today he focuses more on people development, advisory, writing and public speaking in the IT value realisation space. Ade is married with one son and lives in the Chilterns in England. His interests include road / cross-country running and French jive, the latter being a form of dance which Ade has single handedly, and perhaps inadvertently, evolved into a martial art. Introduction: What’s IT All About? Chapter 1. Do you have a Problem? The IT Industry has a Poor Delivery Record. Users are Generally Suspicious of IT People. IT Problems are the Fault of the IT Department. The IT Industry Suffers from Low Self-esteem. Many Businesses do not Know what Business they are in. Chapter 2. Introducing the IT Value Stack. The Need for Strategy Entwinement. Strategy Entwinement – Why it Doesn’t Happen. Strategy Entwinement – External Perspectives. The Need for Process Entwinement. Process Entwinement – Why it Doesn’t Happen. Process Entwinement – External Perspectives. The Need for People Entwinement. People Entwinement – Why it Doesn't Happen. People Entwinement – External Perspectives. The Need for Technology Management. Technology Management – Why it Doesn.t Happen. Technology Management – External Perspectives. The Need for Service Management. Service Management – Why it Doesn’t Happen. Service Management – External Perspectives. The Need for Circulation Management. Circulation Management – Why it Doesn't Happen. Circulation Management – External Perspectives. The Need for Value Management. Value Management – Why it Doesn't Happen. Value Management – External Perspectives. Chapter 10. IT Value and You – The Top 10. 1 Consider IT impact of every business decision. 2 Consider business aspect of every IT decision. 4 Create an IT-centric culture. 5 Treat the IT department like a business. 7 Defi ne and measure IT value. 9 Strengthen the value chain. 10 Become an IT leader.